The winter solstice rapidly approaches, and the advertising world's constant hum has risen to an insistent howl. If you've got an enthusiast of prehistory in your life and are looking for something special to give them, Love in the Time of Chasmosaurs has you covered. 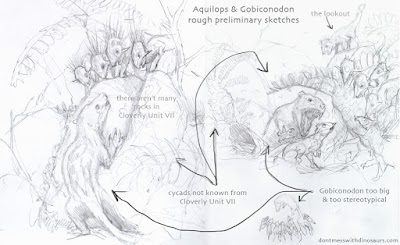 Last year, I posted a three-part guide to independent paleoartists (parts one, two, and three) who all deserve attention and patronage, and whose work would delight fans of paleontology. Since most of those listings are still active, go check them out. 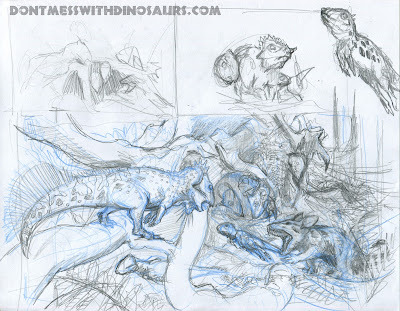 This year, I'm featuring a fresh assortment of individual products, some from paleoart veterans, some from new names. As usual when I do list-y sort of stuff, I'm not pretending to enshrine a definitive List To Rule All Lists. These are cool dinosaur gift ideas that caught my fancy, and I think they have a fair chance of catching other fancies, so let's let the fancy-catching begin. 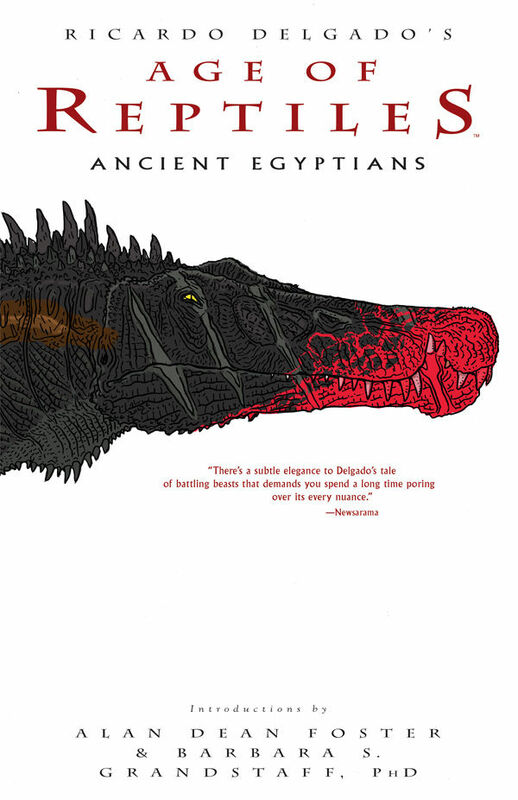 Ricardo Delgado's "Age of Reptiles: Ancient Egyptians"
Ricardo Delgado has returned with a new batch of Mesozoic comics, this time focusing his eye on Cretaceous Egypt. The collected Age of Reptiles: Ancient Egyptians is now available for preorder, with a release date of January 19. Fred Wierum has been on an impressive paleoart streak this year, with a bunch of great work for #drawdinovember, his tyrannosaur resting in golden light, and a recent stunning tribute to Pixar's The Good Dinosaur. 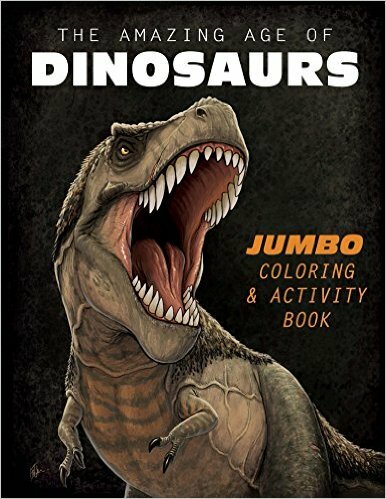 So pick up a copy of his coloring book! Since one totally excellent dinosaur coloring book is never enough, purchase a copy of illustrator Levi Hastings' tribute to mesozoic fauna, Claws, Spikes, and Dinosaur Stripes. More abstracted in style than Wierum's work, it's full of dynamic compositions begging for pigmentation. 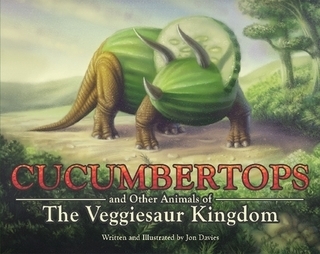 John Davies' "Cucumbertops and Other Animals of the Veggiesaur Kingdom"
Even more fanciful than Hastings' work is the charming book by Jon Davies, Cucumbertops and Other Animals of the Veggiesaur Kingdom. Perfect for that vegetarian paleofanatic in your life. Juan Carlos Alonso and Greg Paul's "Ancient Earth Journal: Early Cretaceous"
None other than Gregory S. Paul has returned to the bookshelves with his illustrations for Juan Carlos Alonso's Ancient Earth Journal: The Early Cretaceous. And if that's not quite enough GSP under the tree, grab one of his "Your Inner Dinosaur" calendars. 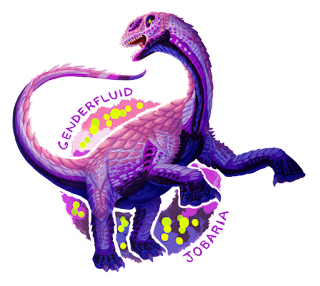 This year, illustrator and character designer R.A. Faller created a series called "Pride Dinosaurs", celebrating the diversity of human sexuality. They are available on a wide variety of formats at Redbubble, but to just pick one, how about Polyamorous Prosaurolophus on a laptop skin? Matt Martyniuk runs a Redbubble shop for his PanAves publishing imprint. I especially love the Proto-Birds and "Ascent of Birds" posters. 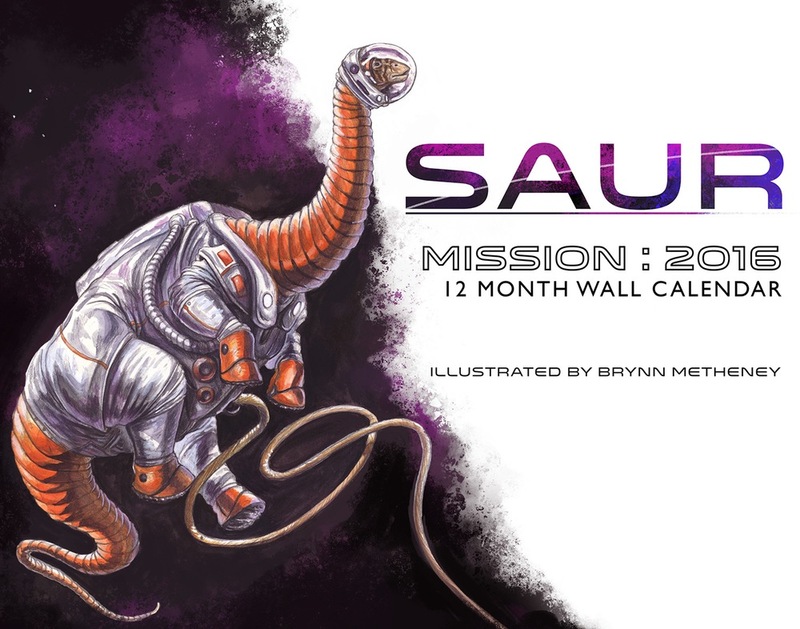 If your dinosaur-smitten loved one also nurses a serious astronomical obsession, Brynn Metheney's "Saur" calendar will do the trick, featuring a year's worth of astronaut dinosaurs. Angela Connor (ICYMI, read my April 2015 interview with her) has made an adorable set of prehistoric croc mugs, featuring Pakasuchus, Laganosuchus, and Kaprosuchus. 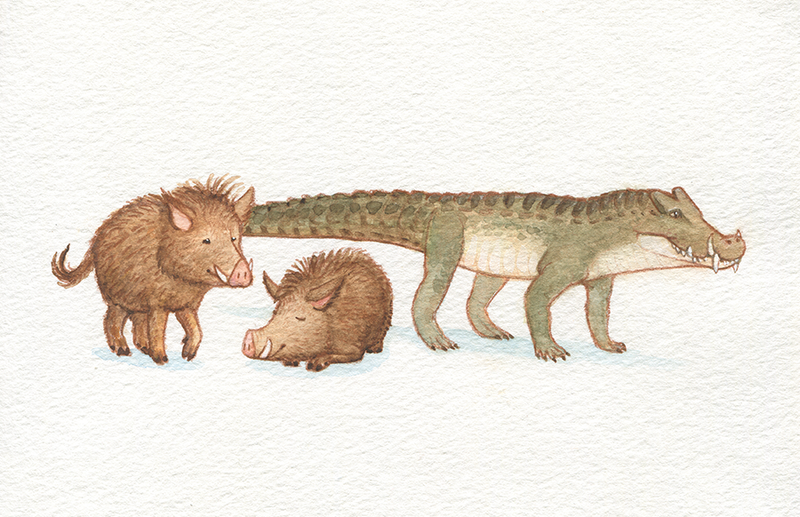 They're fun plays on the animals' nicknames: cat-croc, pancake-croc, and boar-croc. Gareth Monger's "Yi qi Express"
Gareth Monger has a bunch of cool stuff at his Redbubble shop, and my favorite is definitely this toon Yi qi. Hilarious, perfect, would be pretty great on a mug. A WWII bomber art-inspired depiction of a notorious weirdo of a flying dinosaur? What a time to be alive. Finally, the children's book I published this year with my wife, Jennie, is raising money for the Jurassic Foundation, so half of your Mammoth is Mopey purchase goes to funding the researchers who make all of the delightful depictions of prehistoric life you've seen in this post possible. Every limited edition hardcover order comes with an expanded ebook. You can order them here. 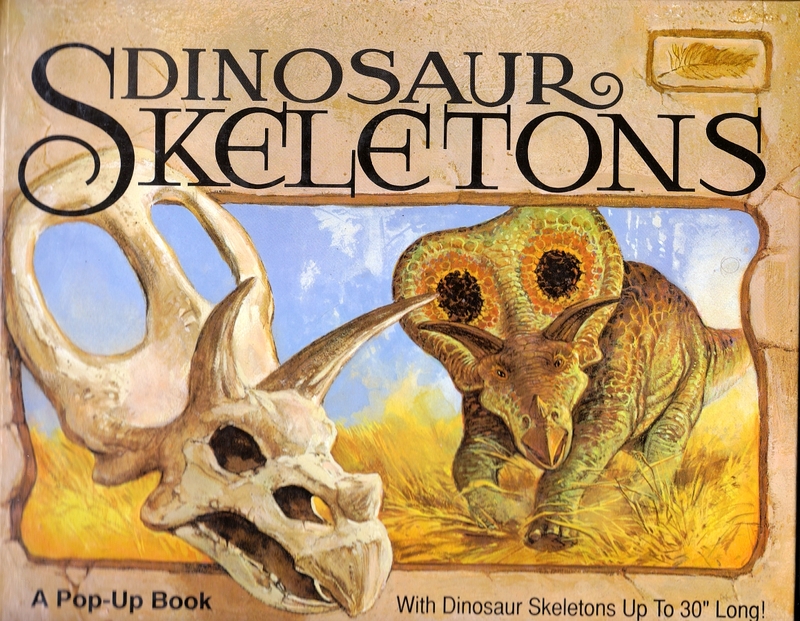 Regular readers will know that I can't get enough of dinosaur pop-up books, having reviewed several over the years, and 1991's Dinosaur Skeletons is a worthy addition to the canon. 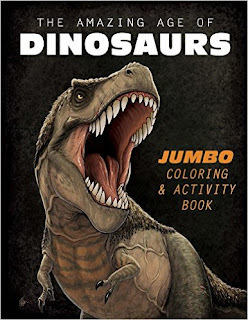 Intriguingly, the book's concept is remarkably similar to that of 1984's Dinosaurs - a Lost World in Three Dimensions, only with considerably more up-to-date artwork - the titular skeletons are the pop-ups, while fleshed-out dinos are confined to the 2D illustrations. Not to worry - even a skeleton can threaten to take your eye out, especially when there's a mouth full of pointy teeth thrust in one's general direction. 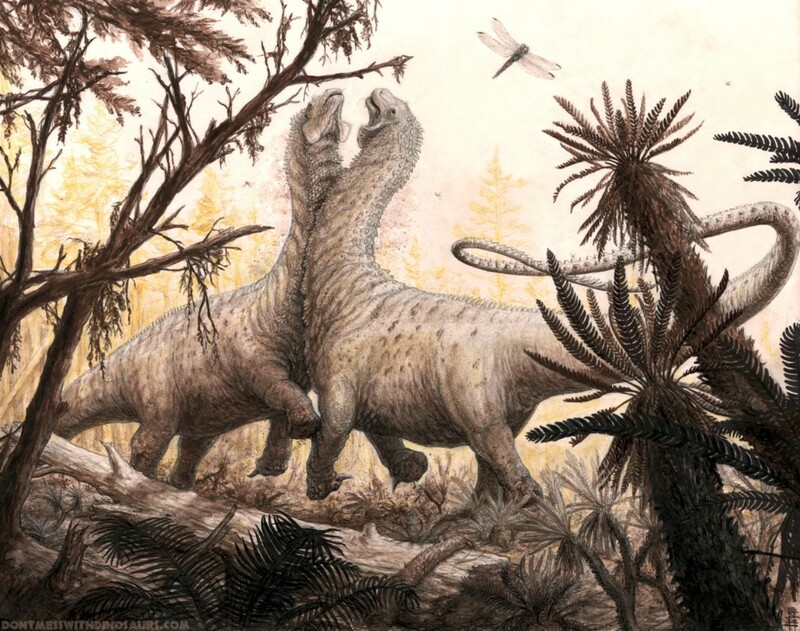 A new big hadrosaur is on the loose, showing off a wee crest hypothesized to be transitional between the non-crested and crested members of the family. Read the description of Probrachylophosaurus bergei and gawk at John Conway's gorgeous portrait. There's a new feathered Ornithomimus specimen from Canada, and Brian Switek and Everything Dinosaur both covered the discovery. And, yes: gawk at Julius Csotonyi's gorgeous illustration. Liz Martin-Silverstone wrote about her recently published research into the relationship between skeletal mass and total body mass in birds and how useful it may be in estimating body mass in critters outside of Neornithes. John Tennant also covered the paper at PLOS Paleo. How wide could theropods open their mouths? New research explores the question. Hat-tip to reader David Landis for letting us know about The New Yorker's recent look at Virginia Lee Burton's Life Story, which we covered for a Vintage Dinosaur Art post five years back. Lisa Buckley's got a new blog, so head over and say "howdy." Asher recently had another fantastic paleontology article published, about the journey of a Clidastes specimen in Alabama. At the Smithsonian National Museum of Natural History blog, Antoine Bercovici writes about the end-Cretaceous (or close to it, at least) dinosaurs of France. Jason Brougham covered the challenges of reconstructing the mysterious Benettites. Everything Dinosaur shows off the new CollectA Spinosaurus. Speaking of spinos, Duane Nash wrote more about Spinosaurus lifestyle and about the and the recent Sigilmassasaurus paper. The Dinosaur Toy Blog showed off the winners of this year's Dinosaur Toy Forum Diorama Contest. I always love checking out the entries. Adventures in fossil prep: Daspletosaurus ilium edition! Brought to you by Anthony Maltese. Andy Farke interviews Justin Adams about a new project to archive fossil mammals at Ditsong National Museum of Natural History in South Africa. Check out part one and two. Fernanda Castano wrote about a new species of pollen grain from Argentina, including Darwin's puzziling over the appearance of dicots in the fossil record. Chris DiPiazza made a sequel of his fun illustration from last year: check out his new line up of monstrously-named taxa for Halloween. A bit more about SVP: Francois Gould wrote about how the conference remains his home even as he shifts from the paleontological research he pursued as a student. Palaeocast's Caitlyn Colleary filed a three-part report focusing on outreach, new research, and the history of the conference. 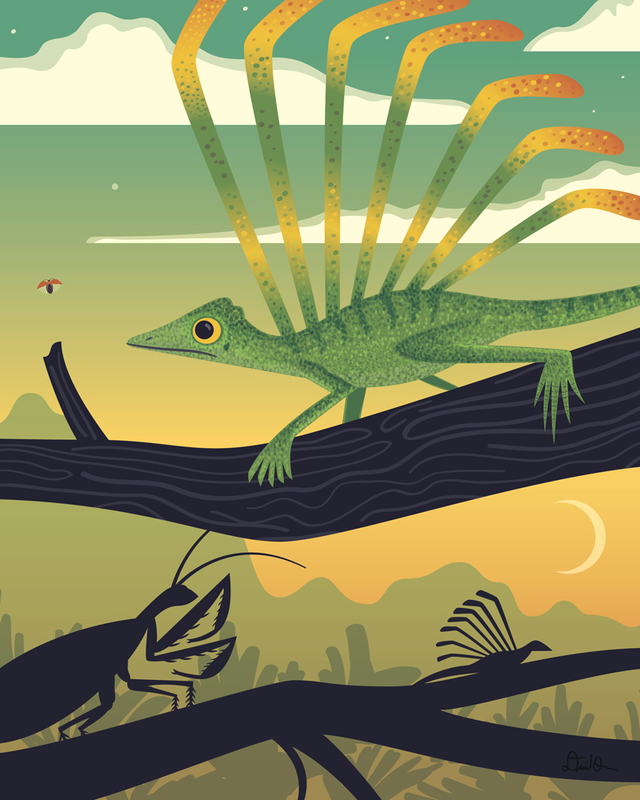 The Cartoon Guide to Vertebrate Evolution by Albertonykus is freakin' sweet and now you can buy it at his new Redbubble shop! 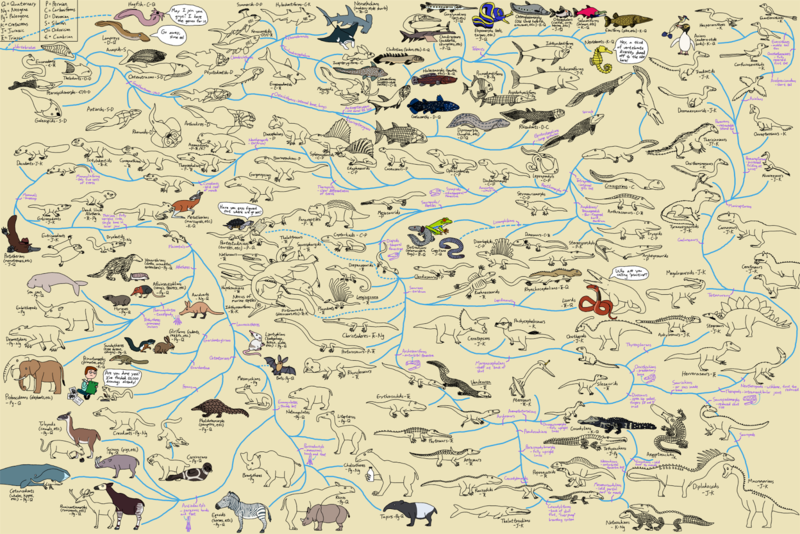 The Cartoon Guide to Vertebrate Evolution by Albertonykus, shared with the artist's permission. Berlin's a fascinating city and all, drawing people for its rich, tumultuous history as much as its present-day reputation for 'cool' (whatever that is. Like I'd know). But in the end, dinosaur enthusiasts will only have one destination in mind upon arriving in the city - the Museum für Naturkunde, home of the certified Tallest Mounted Dinosaur Skeleton in the World™. I visited on my second day in the city, and let me assure you, man-sized humeri were just dancing in front of my eyes before that. No amount of refreshingly inexpensive beer was going to distract me on my pilgrimage to the holy hall of bones on the Invalidenstraße. It doesn't disappoint. Dakotaraptor has stepped into the limelight. 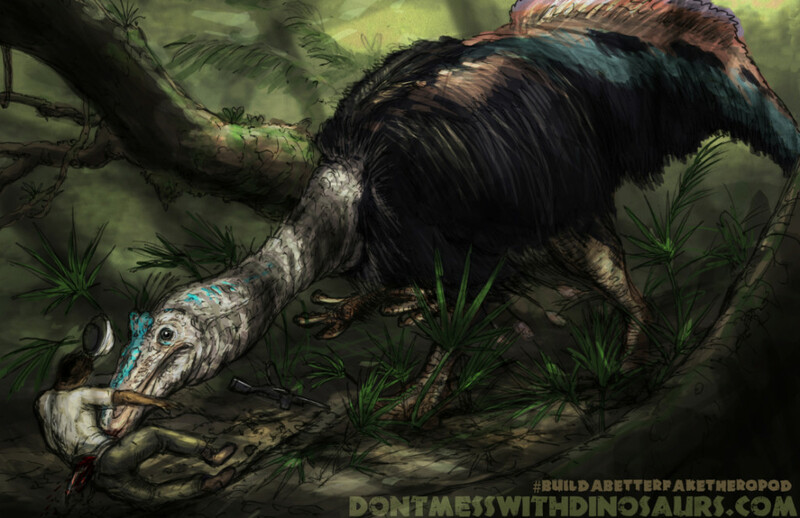 A giant Hell Creek dromaeosaurid with prominent quill knobs and wicked sickle claws, Dakotaraptor would have been a stout competitor for juvenile tyrannosaurs. More from A Dinosaur A Day, Theropoda, and Krankie. 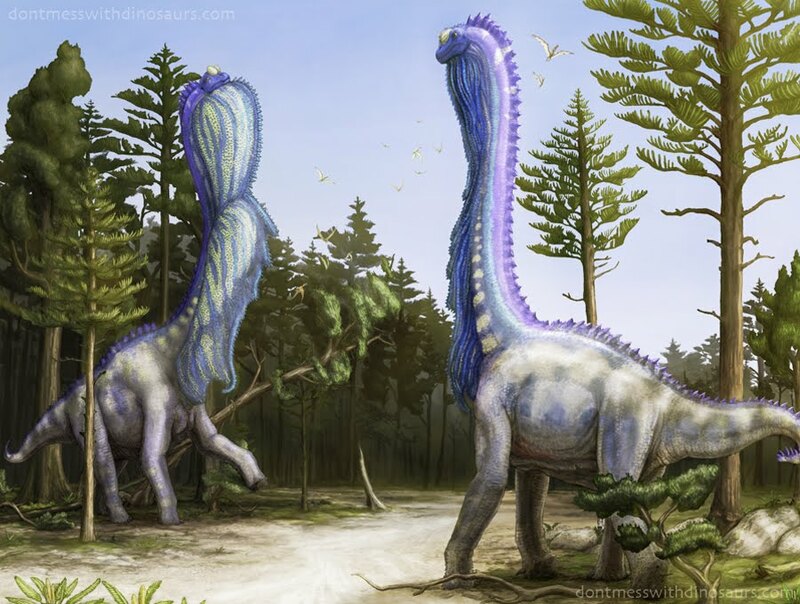 Beautiful paleoart has also been popping up, with particularly stunning work from RJ Palmer and Emily Willoughby (which is hardly surprising). 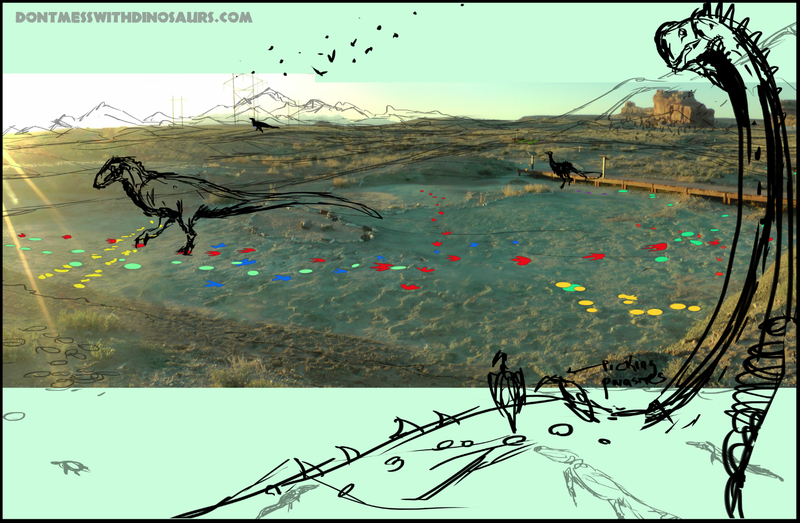 Gorgeous fossils are coming out of an important fossil site in Utah colorfully called the "Saints and Sinners Site." Learn more about it from this interview with Dan Chure of Dinosaur National Monument at KUER. Honestly, I want a large framed print of "the triplets" for my wall. Mesozoic mammal news! A new spiny critter, aptly dubbed Spinolestes xenarthrosus, has been described. Brian at Laelaps and Liz at Musings of a Clumsy Paleontologist, and Amar Toor at The Verge have the skinny. 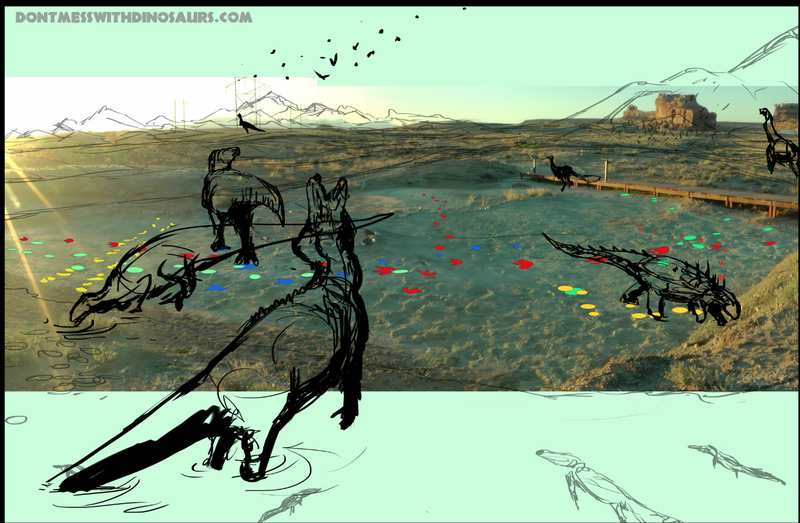 The story of the spinosaurs continues to twist and turn as more research comes out. New work on Sigilmassaurus brevicollis and Spinosaurus maroccanus has been published, responding to last year's major-publication-slash-National-Geographic-media-event. Jaime Headden at the Bite Stuff and Mark Witton both have good takes on the research. Help out Phylopic and nab a spiffy tee shirt! Mike Keesey, creator of the site, is holding a campaign on Booster.com to support the costs of maintaining the site as well as further development. Providing free-to-use, Creative Commons licensed silhouettes of a huge variety of lifeforms, it's a terrific source of images for scientists and other science communicators. We'll start with a roundup-within-a-round up of posts about the annual Society of Vertebrate Paleontology meeting that went down a couple weeks ago in Dallas, TX. At the Theropod Database Blog, Mickey provided four days of commentary: day one, two, three, and four. Duane Nash wrote about the meeting at Antediluvian Salad. Victoria Arbour chimed in at Pseudoplocephalus. John Tennant wrote about his experience at Green Tea and Velociraptors. Albertonykus was there for the first time ever, and wrote about it at Raptormaniacs. Speaking of Victoria, she talked about ankylosaur evolution on a recent episode of the great Palaeocast. Fossil Day 2015 has come and gone, and Chris DiPiazza shared his personal fossil collection at Prehistoric Beast of the Week. Curious about what we will see when the revamped dinosaur hall at the National Museum of Natural History in Washington, DC, opens? Ben Miller has something that may interest you. 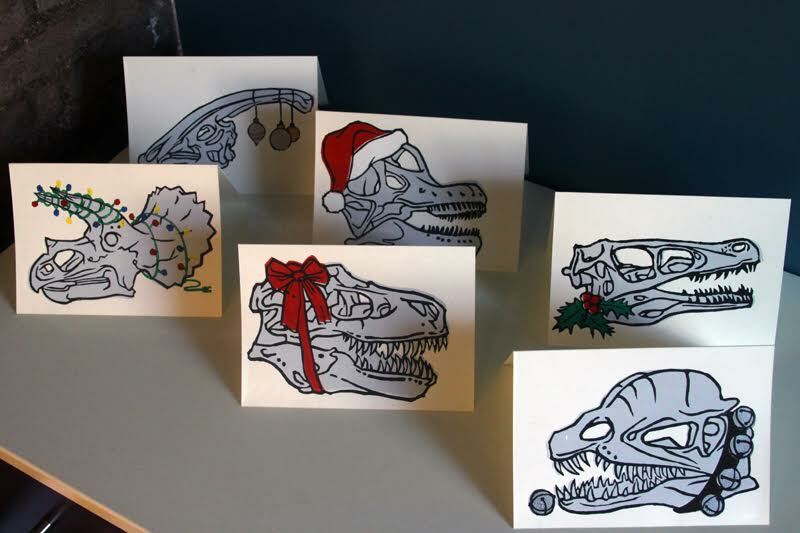 At Dinosaur Postcards, Denver Fowler shared Iguanodon footprint casts. Want to explore the Triassic via computer simulation? 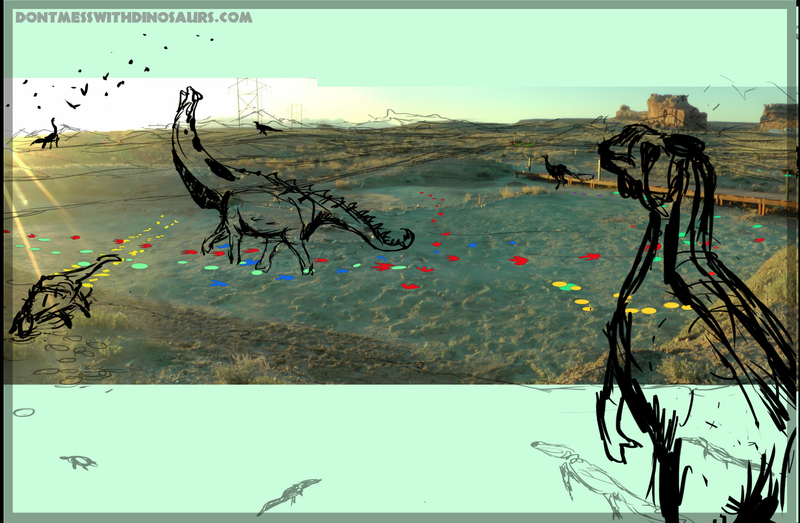 Head to Everything Dinosaur to learn about a new project that aims to do just that. Not terribly recent, but I missed sharing it back in April. Brian Engh talks paleoart at a Bay area Nerd Nite event. 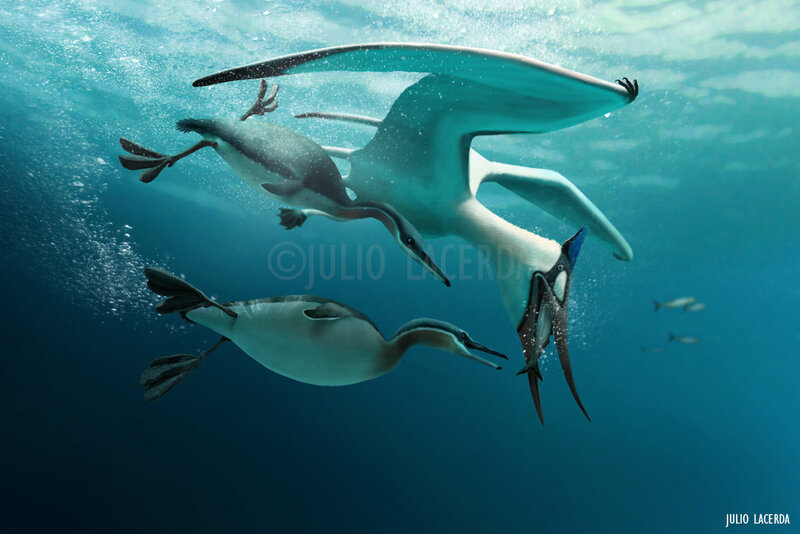 Finding Julio Lacerda's recent painting of Pteranodon and Hesperornis squaring off underwater was a breath-taking moment. 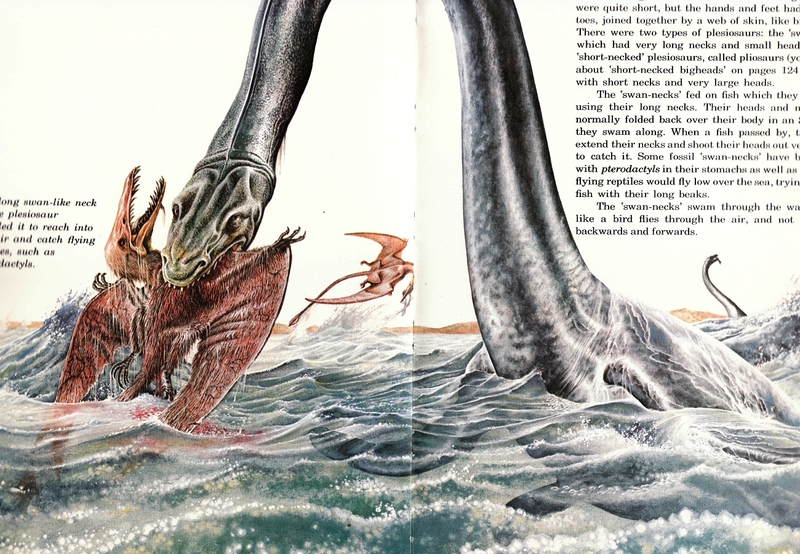 Golden Age of Paleoart, folks! Enjoy. "Fish Theft: Subaquatic Edition," © Julio Lacerda. Shared here with the artist's permission. Because I can't in all good conscience review a book with 'Prehistoric Animals' in the title and only cover the dinosaurs, behold various non-dinosaurs from Purnell's 1976 guide to long-dead beasties. (There's also a tiresomely long section on how MAN evolved to DOMINATE the Earth by being SUPERIOR to the other creatures by virtue of having a large brain, dextrous hands, and other noted attributes of MANLINESS. It's as 1970s as an brightly-coloured Ford Cortina, which you'd be far better off looking at. Here you go.) 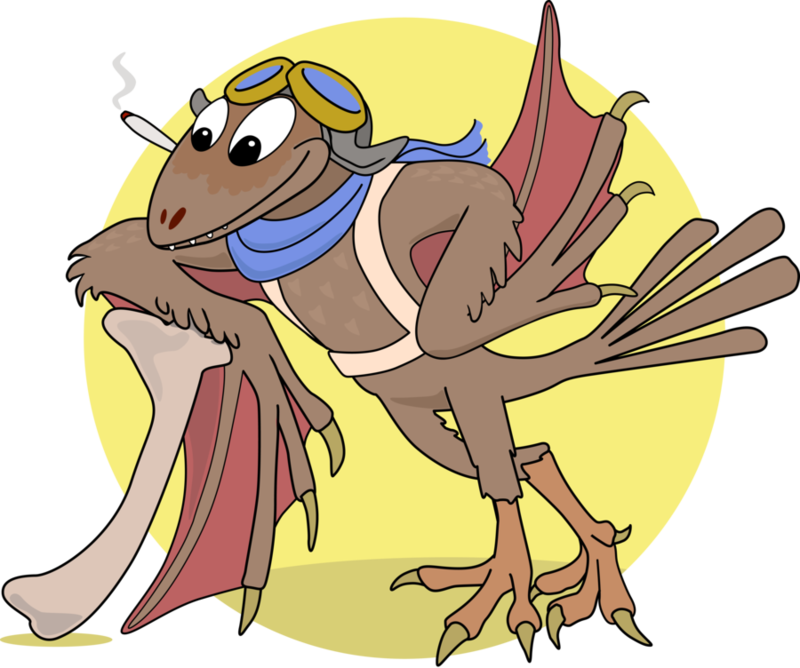 Where better to start than with a pterosaur being munched? Stupid pterosaurs. The center of the paleontology universe this week has been the 2015 Society of Vertebrate Paleontology meeting in Dallas, TX. Check out the official conference hashtag on Twitter. LITC's own Asher Elbein is there, and will be filing a report about his experience soon. Asher recently joined Twitter, and has been tweeting from the conference, including some wonderful sketches. Speaking of SVP, those lucky devils get to see a newly prepped centrosaurine skeleton, which appears to be a new species of Avaceratops. It was discovered amid a pile of hadrosaur bones in 2012, and even had a bit of skin associated with the pelvic area. Anthony Maltese has the full breakdown over at the RMDRC Paleo Lab Blog, with great photos, so scoot! We have a new giant in the North. 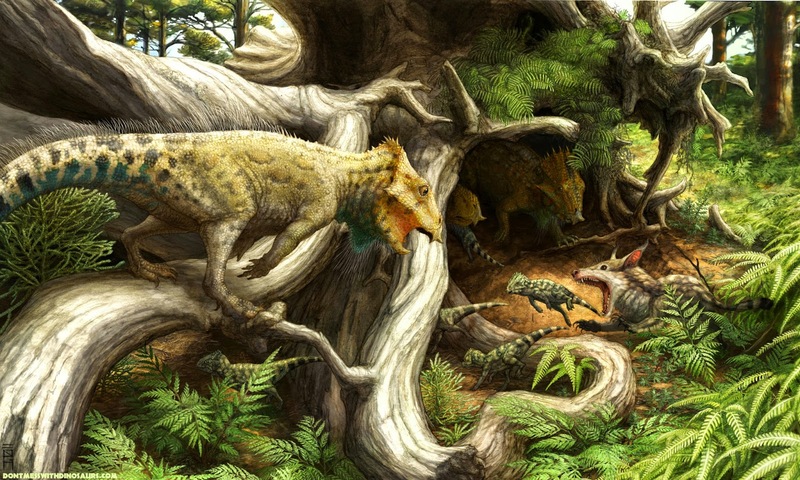 The "Edmontosaurus" fossils of the Price Creek Formation have been reassessed, and the team of Hirotsugu Mori, Patrick Druckenmiller, and Gregory Erickson have dubbed the new taxon Ugrunaaluk kuukpikensis. Read more from Brian Switek at Laelaps and Tanya Basu at Time. Andy Farke writes about the publication of a new juvenile Saurolophus specimen at The Integrative Paleontologists. RJ Palmer drew a toon version of the Saurian T. rex we featured in the last roundup, and it sort of makes me think a toon version of Saurian would be the best idea. 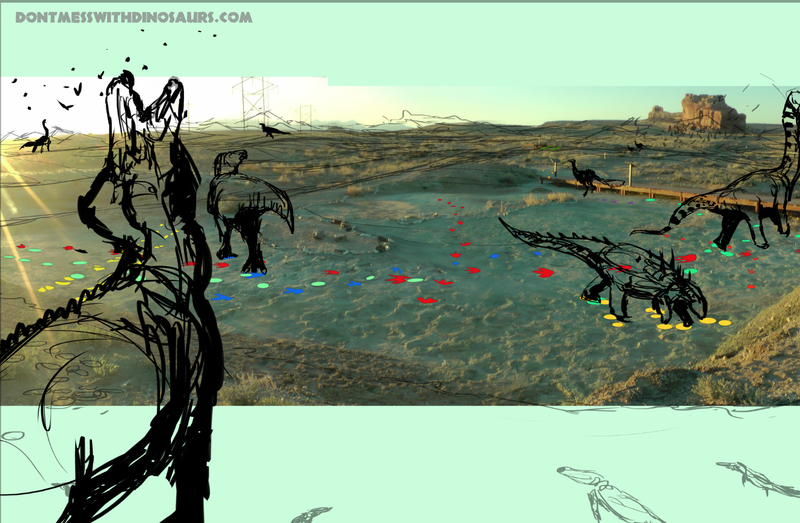 After the team wraps up Saurian itself, of course. 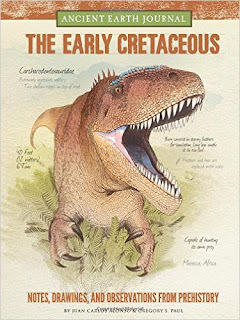 A couple of reviews of the recent book British Polacanthid Dinosaurs have hit the web: Everything Dinosaur gave it a read, as did Stu Pond at Paleoillustrata. The Guardian is looking to recruit a new paleontology blogger, who will work under the Guidance of Dr. Dave Hone. The call for submissions will last until November 2. Read more about the opportunity here. I loved this adorable felted Parasaurolophus at Needled by Nella. 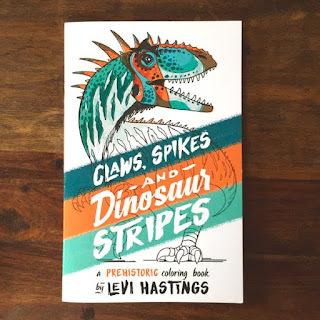 Herman's back with another pair of dinosaur book reviews at ART Evolved. 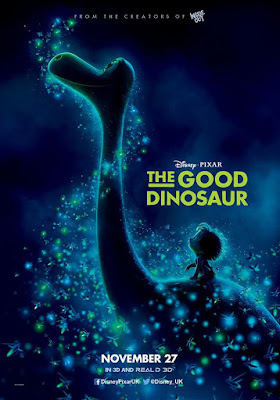 He looks at Dinosaur Parents, Dinosaur Young: Uncovering the Mystery of Dinosaur Families and Dinosaurs: Living Monsters of the Past. For Ada Lovelace Day, Liz Martin-Silverstone paid tribute to the women who have brought so much to the field of paleontology. 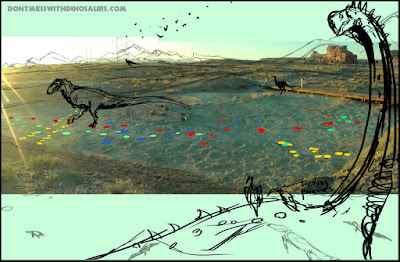 It is the 100th anniversary of Dinosaur National Monument, and a major new project has been launched: The Digital Quarry Project. The interactive site allows visitors to explore the jumble of bones in the famous quarry wall by way of simplifies silhouettes. It's not complete yet, but the project site promises that "it will contain all 5000+ fossil specimens from the quarry, including those that have been excavated and now reside in museums far and wide." It's pretty cool, check it out! I Know Dino celebrated Dinosaur National Monument's anniversary as well. This is one of the most iconic scenes from the book thanks to Luis Rey's rendition of the scene years ago. I tried my best to make mine as different as possible and looked to Bill Watterson's Calvin and Hobbes snow sleigh strips for ideas. Calvin and Hobbes crashing into the snow was the first thing to come to mind when I was figuring things out. This piece brought the memory of reading that scene for the first time rushing back. "The Raptor Red Snow Sled," © Zubin Erik Dutta. Shared here with the artist's permission. 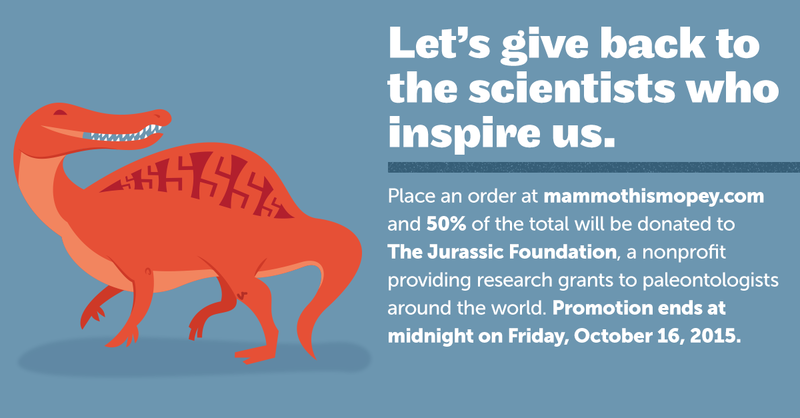 I've been wanting to do something to help out The Jurassic Foundation for a while. They are a nonprofit that supports dinosaur research worldwide by offering grants to paleontologists, many of whom are from developing countries or are early in their career. 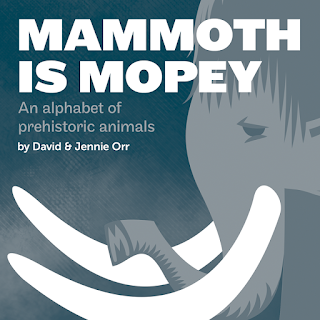 To celebrate the fifth National Fossil Day, half of all Mammoth is Mopey hardcover and ebook sales this week will be donated to them. That's $7.50 of every hardcover sale and $3.50 from every ebook sale going straight to the Jurassic Foundation. The promotion will last until midnight on Friday the 16th. Here are a few adverts I whipped up to spread the word. Feel free to share them if you'd like. 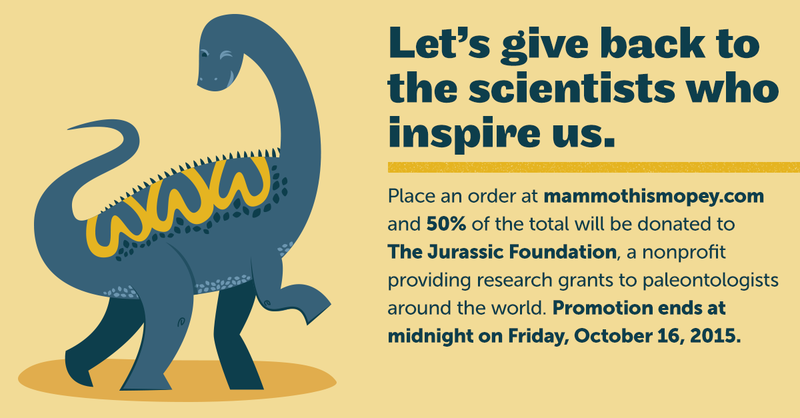 Jennie and I appreciate any help you'd like to give, and so does the Jurassic Foundation, we're sure! 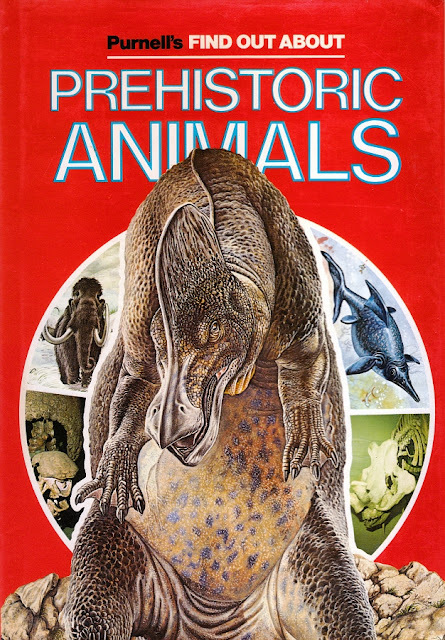 Not for the first time, here's a fantastic 1970s book on prehistoric animals from Purnell, purveyors of fine model photography and anachronistic pop-up battles. 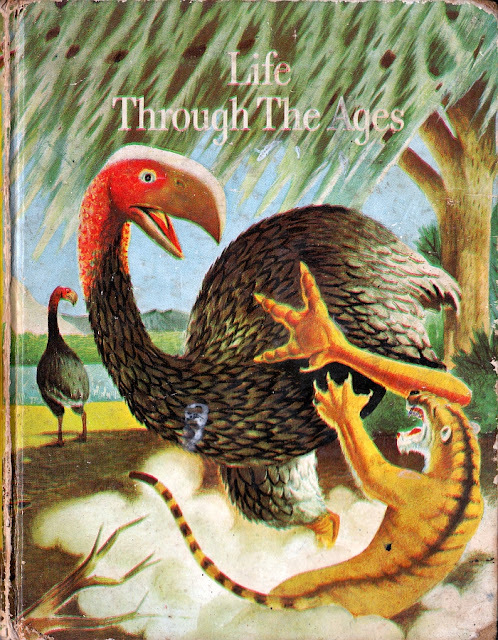 Find Out About Prehistoric Animals is considerably more hefty than any Purnell to previously feature on this blog, and it's gloriously packed full of wonderfully retro illustrations from a number of artists. While individual pieces aren't credited, we are at least informed that the artists included Eric Jewell Associates, Illustra, John Barber, Angus McBride, Sean Rudman, Dan Escott, Colin Rattray, Vanessa Luff, Gerry Embleton, Phil Green, George Underwood and - oh yes - John Sibbick. Nine years before even the Normanpedia. Blimey. 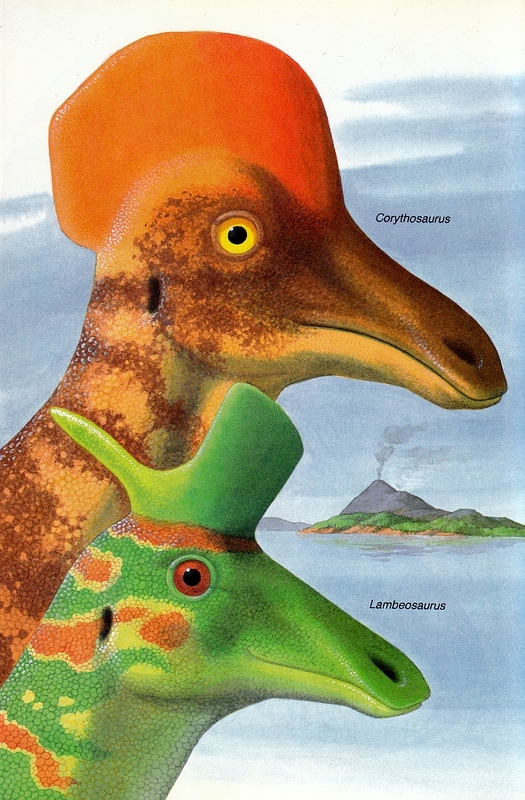 There's probably a good point at which to stop posting about the same 1980s children's dinosaur book, but it isn't before you've covered any hadrosaurs. Therefore, please be welcoming of one last round of the Childcraft Annual, and of John Rignall's delightfully coloured bright-eyed lambeosaurines. It's a lovely day to be sporting a solid orange head crest, having tangerine dreams and admiring the smoking scenery. Interested in the evolution of ankylosaur tail clubs? Of course you are, and you're in luck. Victoria Arbour's new research is all about it. Matt Bonnan announces the publication of Pulanesaura, a new sauropod from South Africa dating from the early Jurassic - an important time in the evolutionary history of the clade. 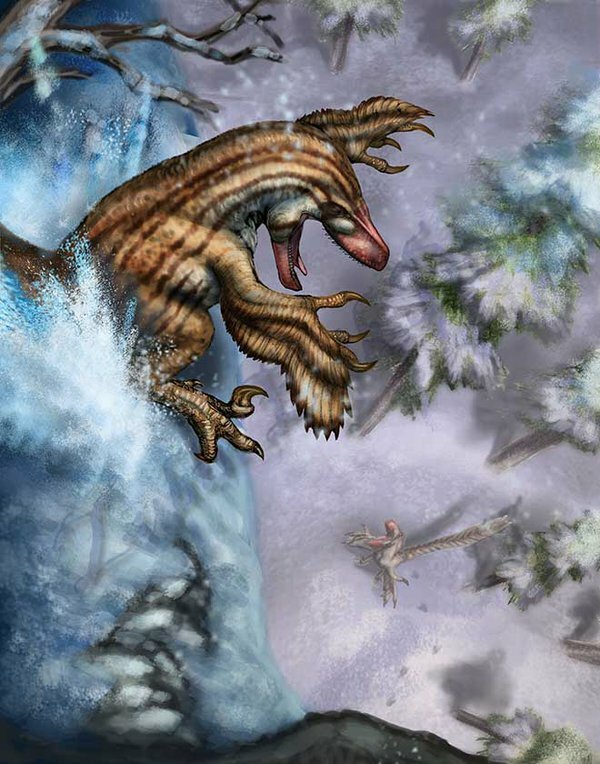 At SV-POW, Matt Wedel deigned to write about a "stinkin' ornithischian." The Dinosaur Toy Blog reviewed the LEGO Velociraptor. Trish Arnold trained her wit on Walking With Dinosaurs 3D during a recent live tweet session. At Laelaps, Brian Switek interviewed paleontologist Robert Gay about his experiences teaching natural history to high school students. Paleontology field work ain't all glamour and gorgeous badland vistas, Lisa Buckley reports. 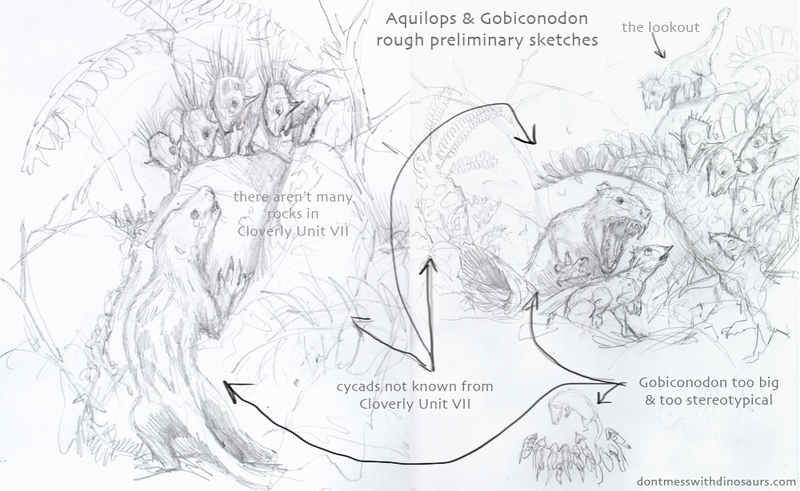 At Prehistoric Beast of the Week, journey into the bowels of the AMNH with Chris DiPiazza. 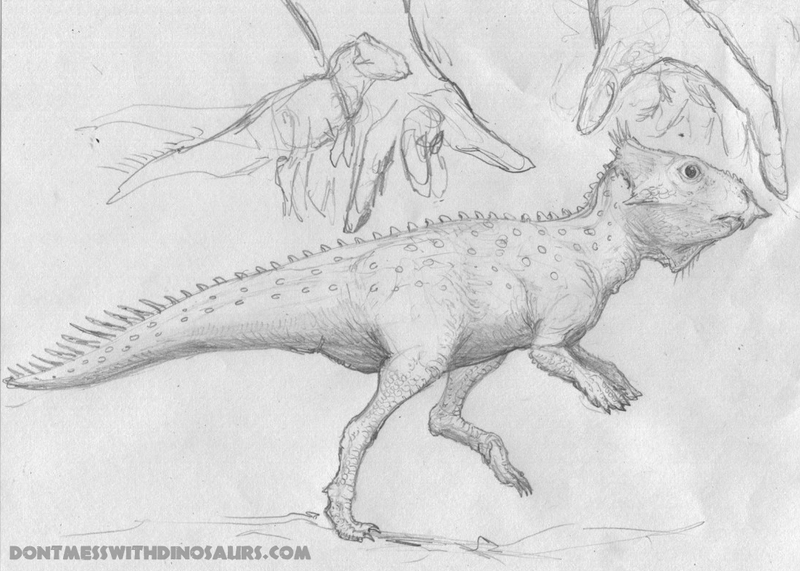 Mark Witton recently announced his upcoming paleoart book, and has launched his own Patreon page. An exceptional fossil mount at the Denver Museum of Nature and Science was profiled recently by Ben Miller. The Saurian team released some animations of their new T. rex design, and it's a stunner. 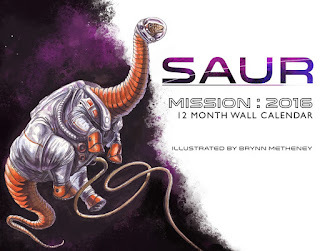 The Saurian T. rex, ©2015 Urvogel Games, LLC. 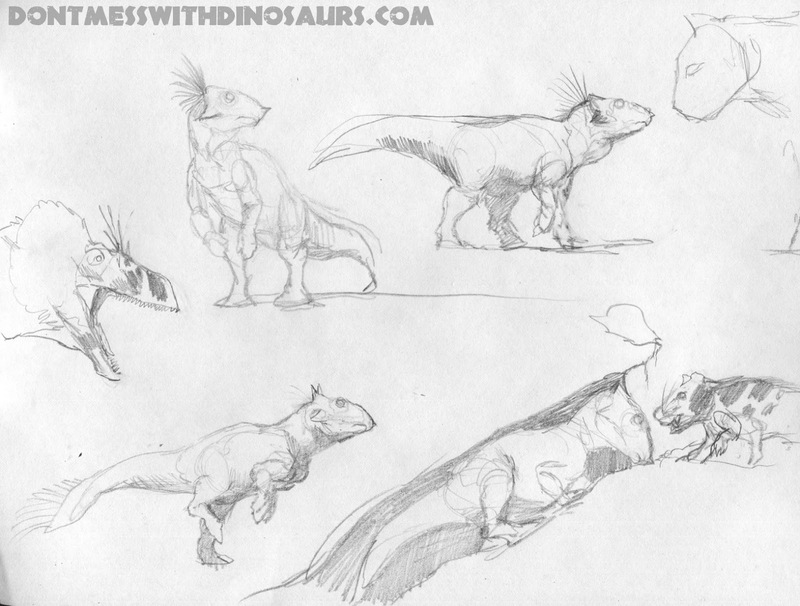 Read more about the redesign of their tyrant at the Saurian game blog. 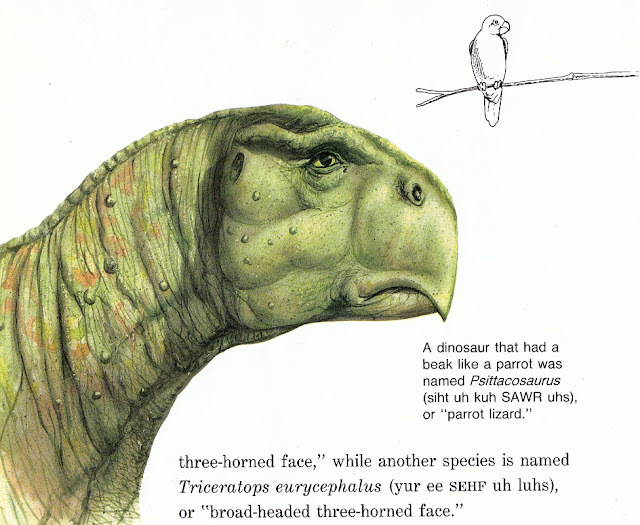 Having already looked at saurischian dinosaurs in my first two posts on the 1987 Childcraft annual, it's high time some ornithischians were allowed to show their controversially cheeked faces. There's some more Greg Paul art in this category, but why don't we start with something that proved popular on Facebook? May the 1980s bonanza continue (please do check out part 1 for background, amusing spinosaurs etc.) Having exclusively featured theropods in the first post, let's turn now to their fellow saurischian dinosaurs - you know, the often staggeringly huge ones with the long necks, long tails, and tendency to appear far more loveable than a reptilian behemoth the size of a house probably should. But we haven't just got sauropods - we've got Gregory S Paul™ sauropods! Back in July, JT Covenant used a comment on my review of Ladybird's The Lost World to point me to a book that they thought I'd enjoy. I can happily say that they were right on the money. In fact, finally receiving this hefty old thing through the post (it came from the US) sent me quite giddy with glee. Not only is it illustrated by a panoply of artists, all with wildly varying styles, all of whom are credited (including Greg Paul! 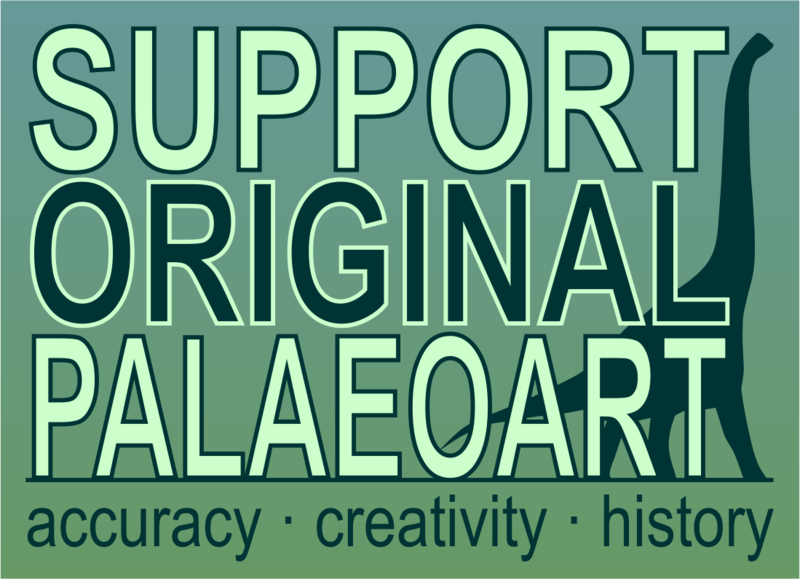 ), but it's virtually a comprehensive encyclopedia of '80s palaeoart memes. Some are tiresomely familiar, but there are also some very weird ideas in here that have long since been rendered obsolete. To cap it all, it's from the very year I was born. It's Dinosaurs! 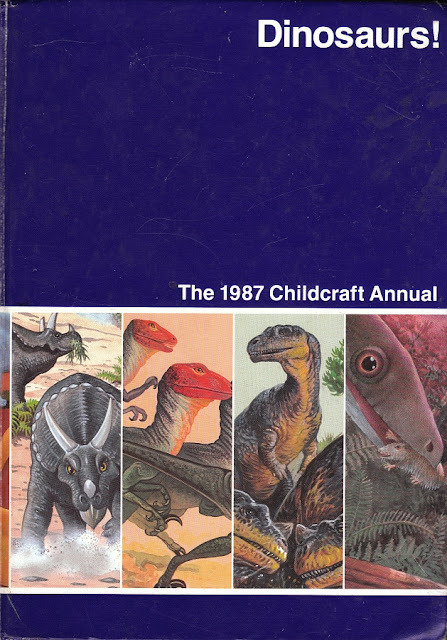 The 1987 Childcraft Annual. As part of the Mammoth is Mopey crowdfunding campaign, I offered custom illustration commissions as some of the higher perks, and now I've fulfilled them. Two of the backers, Emily Willoughby and Michael Fleischmann, asked for prehistoric subjects, so I figured I'd toss them up here. To check out all four pieces, head to my recent post at the Mammoth is Mopey blog. First, Emily wanted me to create a new character in the style of Mammoth is Mopey. She wanted a Deinonychus that represented her love of learning. Remembering that I'd once shared a photo of an Eastern Towhee and remarked that it reminded me of one of her beautiful dromaeosaurs, she suggested I try that songbird's coloration. 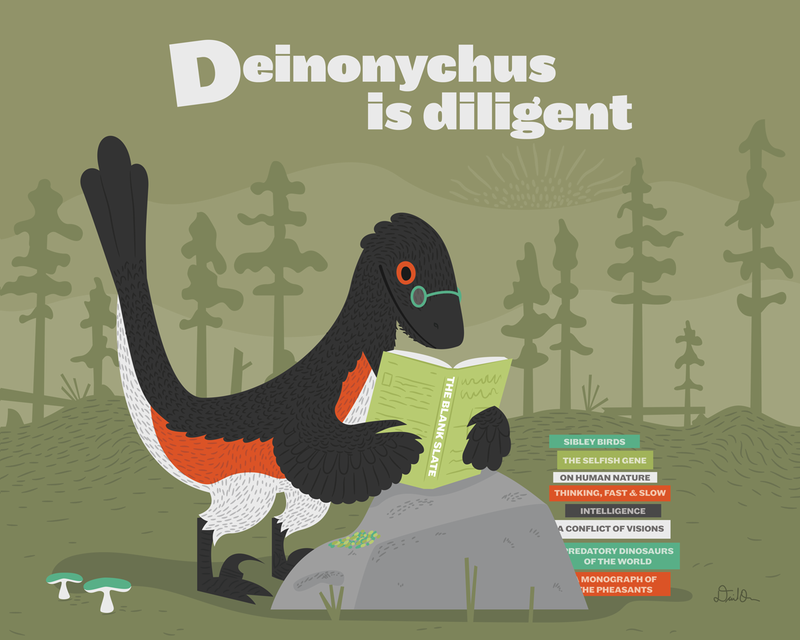 Deinonychus is Diligent, © 2015 David Orr; commissioned by Emily Willoughby. Michael asked that I stretch out a bit from the Mammoth is Mopey style and only prompted me with the taxon he wanted: the Triassic oddball Longisquama. I loved digging into the paleoecology of the Madygen Formation. Learning that Longisquama lived alongside the enormous titanopteran insect Gigatitan, I had no choice but to include it in some way. Once I sorted that out, having a considerably smaller cupedoid beetle attracting the foreground Longisquama's attention seemed like a good choice. Longisquama Sunset, © 2015 David Orr; commissioned by Michael Fleischmann. I'll have another piece of Mesozoic art to share soon, along with some musings about paleoart I've been kicking around in my noggin lately. The dust of Jurassic World may have settled too long to warrant sharing these pictures now, but I was in the throes of moving house, followed by a lengthy period without home internet, and lacked the opportunity previously. Still, I felt I couldn’t have these pictures on my hands without posting them on the blog. 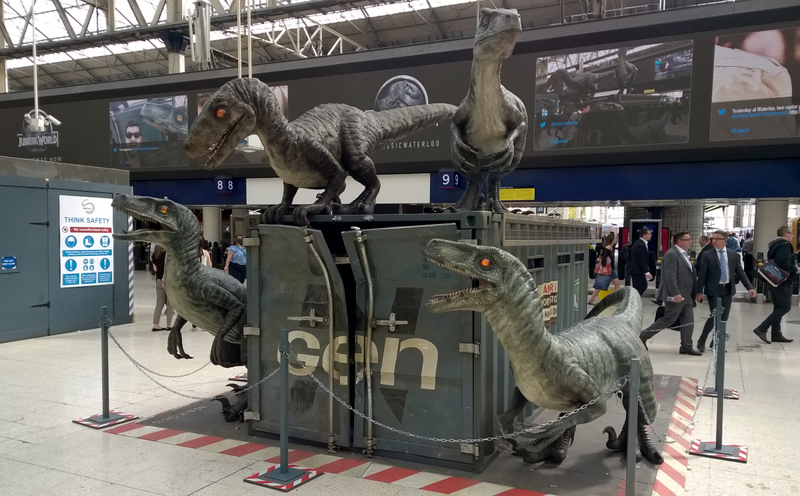 During the first week of Jurassic World’s release, London’s Waterloo Station took part in what can only be described as a promotional extravaganza with a display featuring models of the film’s ‘raptors’. Visitors were encouraged to take their own JW selfie with the beasties and to share them on Twitter. Yes, folks, it had its own hashtag. I had hoped to drag Marc along for this privilege. Sadly, the display only lasted a week and there wasn’t enough time. Given that the last book I reviewed was so very bland and predictable (complete with the obligatory post-Normanpedia Sibbickisms), I was very happy to come upon this wonderful, ageing collection of barely held-together cloth boards on eBay. 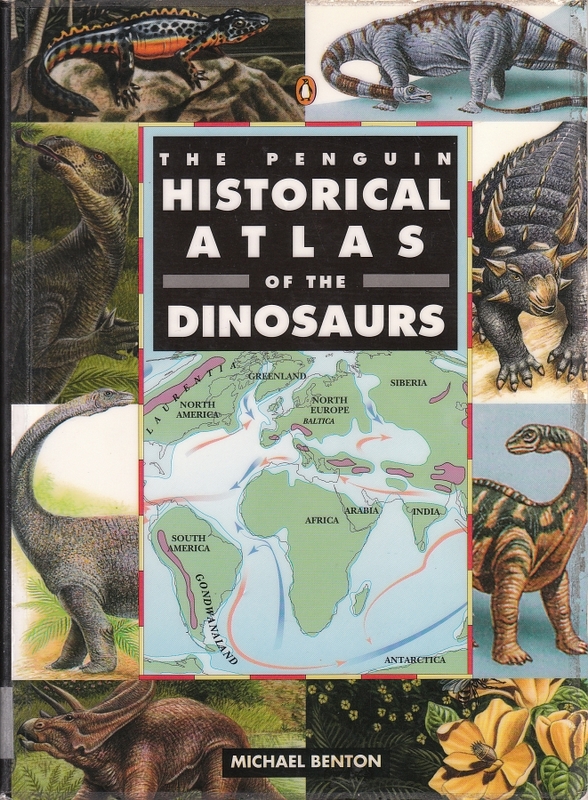 This international edition of Dinosaurs and Other Prehistoric Animals dates from 1972, but in its original form it would appear to go all the way back to 1959. 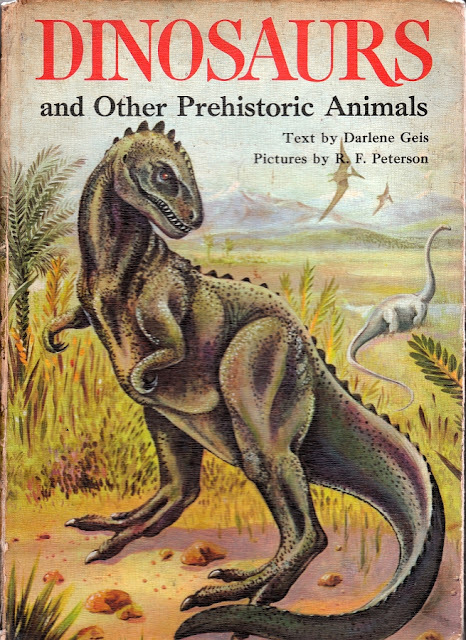 What with its glorious collection of Zallingerian swamp beasts and Knightian lizard-headed tyrannosaurs (all painted by R F Peterson), it's an absolute treat for fans of truly vintage dinosauriana...even if some of the artwork isn't terribly accomplished. Fossil hunter Wendy Sloboda was honored for her years of work with the description of Wendiceratops pinhornensis. While it's always fun to see a new ceratopsian with some new configuration of headgear published, this is especially interesting because it's the earliest known centrosaurine ceratopsid. Read more: Integrative Paleontologists, Laelaps, Royal Ontario Museum. The publication of a new Cretaceous snake, Tetrapodophis, was met with a mix of delight, surprise, and facepalms. While snakes experimented with a variety of limb configurations during the cretaceous, Tetrapodophis was the first found that reveals four limbs. They're small, and probably more useful for grasping than locomotion, but they're there. Unfortunately, the provenance and legality of the fossil is questionable. I'm going to go ahead and just suggest reading Dr. Shaena Montanari's article for Forbes Science, which explains both the potential significance of the find as well as a good dissection of the ethical and legal concerns. At Pseudoplocephalus, Victoria Arbour shares pics from her visit to Dinosaurs Unearthed. Not Mesozoic and I don't care! Gareth Monger's cute Hallucigenia. Check out Rebecca Groom's life-size Velociraptor plushie! Speaking of plushies of the prehistoric orientation, check out the Kickstarter campaign by Jungle Plush. The company says they strive "to make our plushies in a way so that any young dino enthusiast can easily identify and learn about their favorite dinosaur, all while having fun at the same time." And it looks like the campaign has funded! There are a few more days to chip in, however. What can be said about the spinal cords of extinct animals? Liz Martin's got some ideas. Fernanda Castano has a post specially crafted for all you lovers of paleontology's history: Owen, Dickens, and the Invention of Dinosaurs. At The Integrative Paleontologists, Andy Farke interviews Mike Keesey about his terrific website, Phylopic. Dave Hone is publishing a book about tyrannosaurs! At Method Quarterly, Laura Bliss writes a nice triptych of interviews, providing an introduction to paleoart for the uninitiated. Read what Doug Henderson, Mark Witton, and Emily Willoughby have to say. 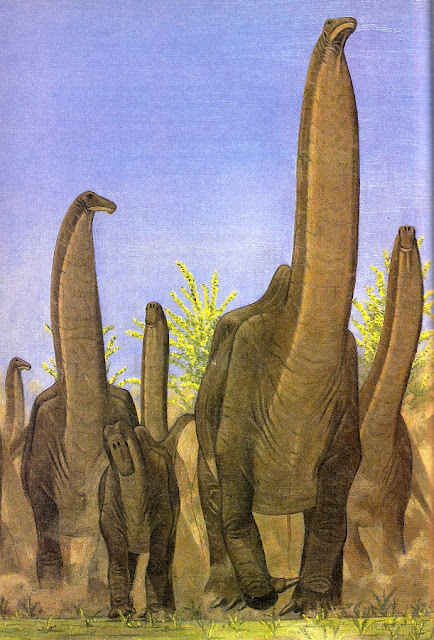 I love paleoart that tells a story. Certainly, restorations that Marc refers to as "spotter's guide" style (isolated against a white background) have their place, and I often love them. 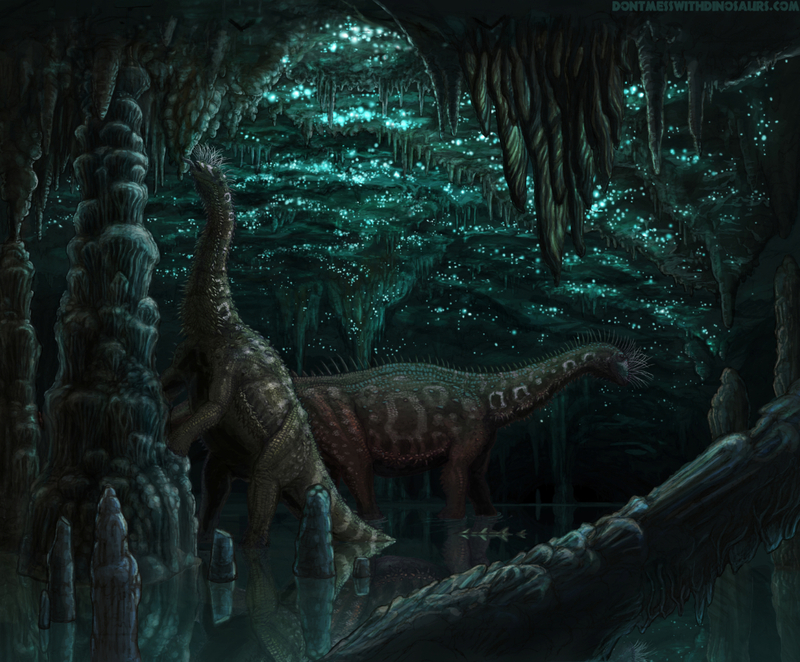 But a well-thought out paleoart story captures the atmosphere of a lost world, has the feeling of a dream made real. 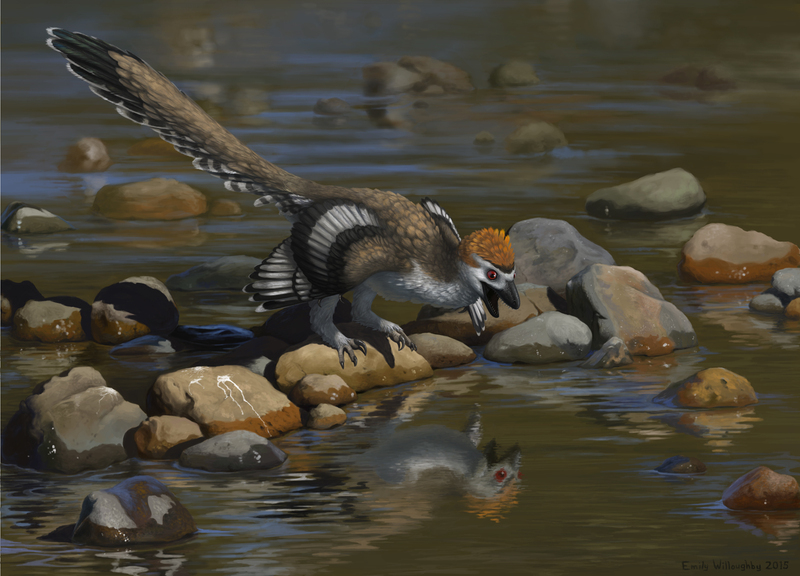 Emily Willoughby is a master of this, as shown in her recent take on Zhenyuanlong suni, a new dromaeosaur from China. Read more about the story she is telling over at her DeviantArt page. Zhenyuanlong suni, © Emily Willoughby. Shared with the artist's permission. Blame Mammoth is Mopey for the lag in round-ups. It's pretty well been a full-time job since March. Once the campaign was funded, production and fulfillment ate up most of my and Jennie's time. But this week, with the completion and release of the expanded ebook, things are easing up quite a bit. Now my main task is to complete the custom illustration perks, which are proving to be quite a bit of fun. I've been spending time with a studious dromaeosaur, a notorious Triassic weirdo, some charismatic canids. I'll be sure to share them here when they're done!